I will admit, this is not my recipe, but I have memorized it because it’s just SO easy. 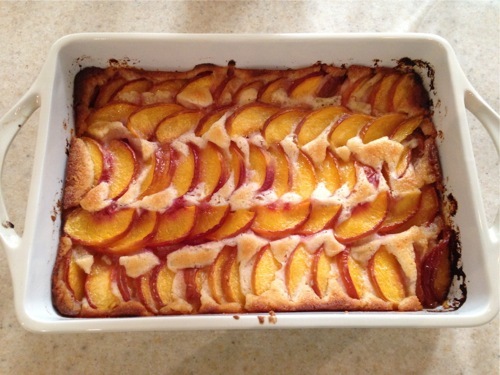 You can make this recipe with just about any type of berry or stone fruit (or mix!) and it will be wonderful. Put the stick of butter in a 9″ by 12″ pan, and stick in the oven to melt the butter. Whisk together the flour and sugar, then add the milk and stir until mixed. Wash and cut up fruit. Once the butter is melted, pour in the batter, add fruit on top. Bake for one hour or until top is browned. Easiest thing ever right? 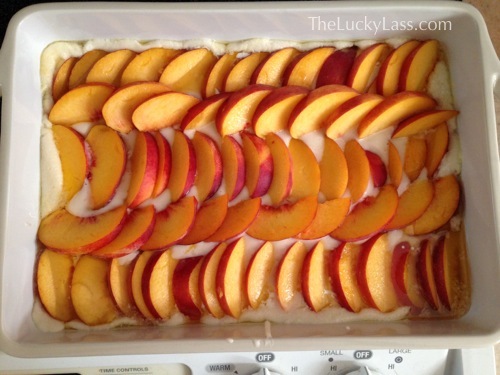 And perfect for a somewhat light and fruity summer dessert! 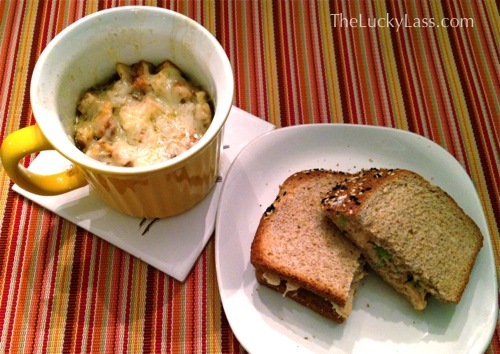 The other night Mr. Lucky and I decided to have “Bistro Night” for dinner. 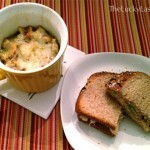 I made chicken salad for sandwiches, and he made French Onion Soup! He found the recipe for the soup on Martha Stewart, and it was excellent. The only thing we would change is to cut back on the amount of Thyme called for (by at least half). 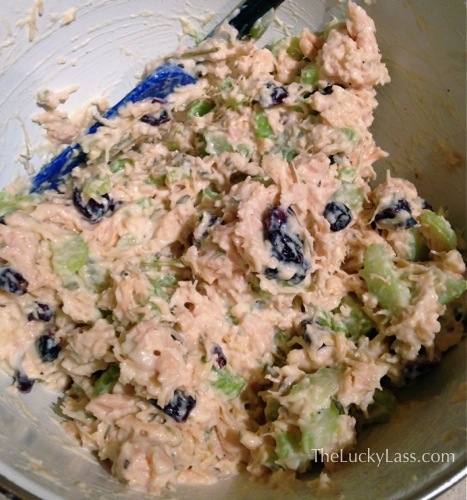 I am sharing my own recipe for chicken salad, that I developed after enjoying the sandwiches as Starbucks. Not wanting to spend $8 on a little sandwich, I knew it would be easy to come up with something similar that I could recreate whenever I wanted. As with most recipes- you can change any amounts to suit your taste. Usually I don’t measure anything and just go with what I think looks good. Add craisins and mayo, stir all together until well mixed. Add lime juice, tarragon, and garlic powder, stir until well mixed. Add salt and pepper to your taste preference. 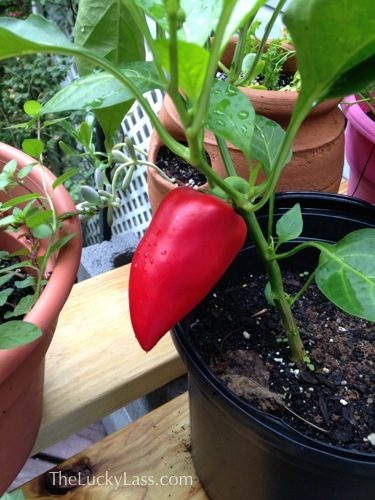 Store in the fridge up to a few days. 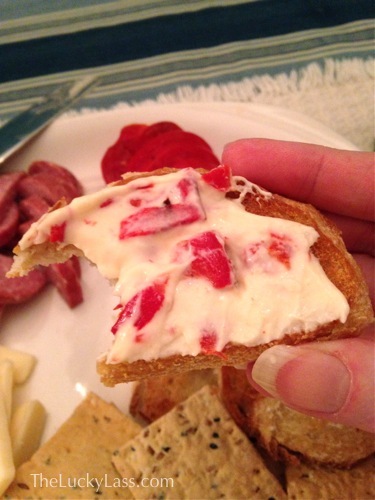 Enjoy on your favorite whole grain bread! 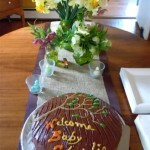 In early April I attended a baby shower for my Step-Daughter-in-law at her mother’s house. It was a beautiful day, in a beautiful setting with the new mom surrounded by loving family and friends! I was able to help a very little bit by bringing a burlap table runner, lots of fresh flowers from my garden, and just a few little extras to add to the theme- a Woodland Baby Shower. The theme is based on the nursery theme– full of cute woodland creatures, and the beauty and bounty of nature. Our gracious host, Linda, provided her home as the location for the shower, which itself is set out in the countryside, surrounded by woods, farmland, and horse country. 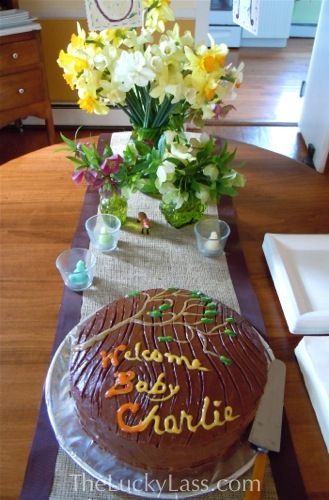 Spring is the perfect time of year to have a baby because everything seems so fresh and new! 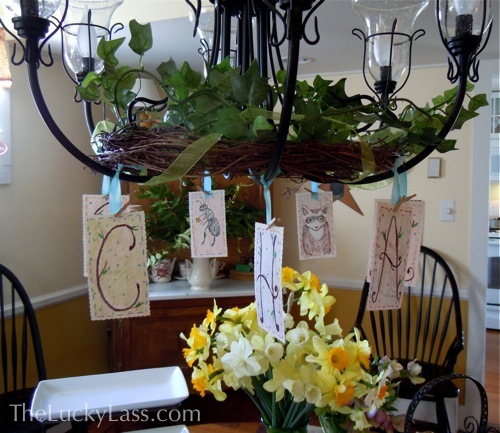 Linda made these cute cards to hang from her chandelier in the dining room- one side with a letter, and the other with a cute animal. 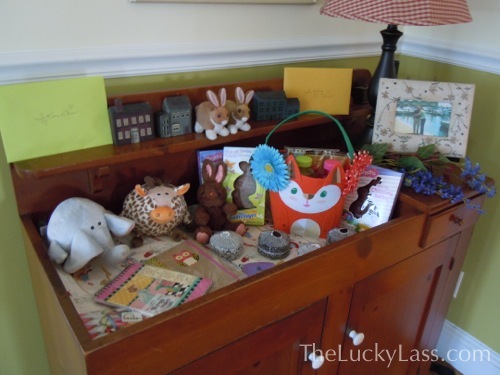 She was nice to let me share these pictures of her home and drawings on my blog! Her inspiration was the theme of the nursery. Aren’t they so cute! 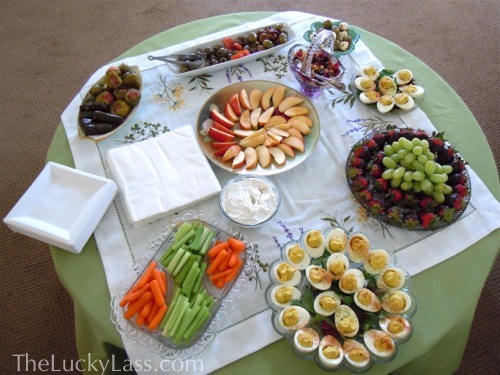 She also had a delicious spread of deviled eggs, olives, fresh vegetables, grapes, chocolate dipped strawberries, cheese and crackers, and trail mix. 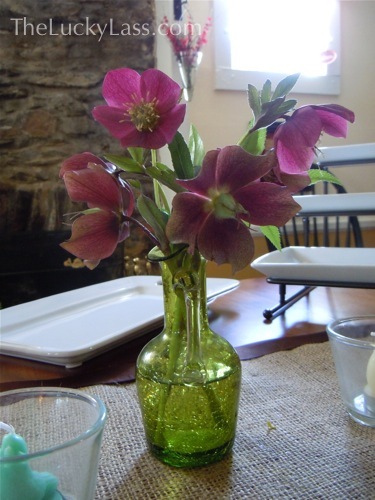 I brought the embroidered tablecloth, which has pretty little Irish native plants on it. And the cake! Delicious and made in house as well! The cake was modeled after other Woodland themed cakes we found online. I think it came out so nicely. 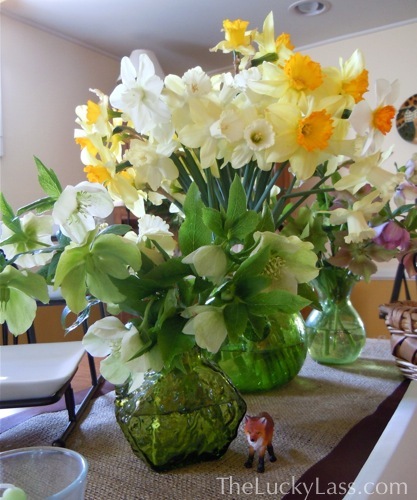 Lots of fresh spring blooms. Little details, like this toy fox, made a difference. 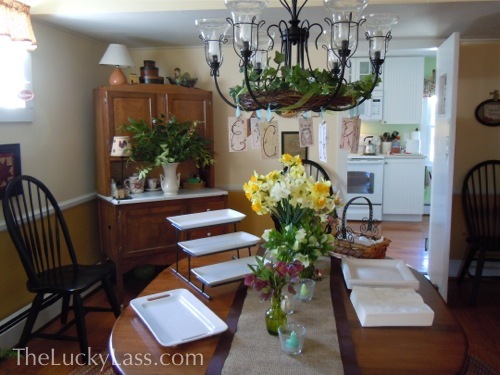 I’m so glad I’ve been able to use the burlap table runner again! We also played a couple of games, of which the winners got to choose from the Party Gifts table. Little Charlie made his debut just less than a month later. Isn’t he a cutie pie? 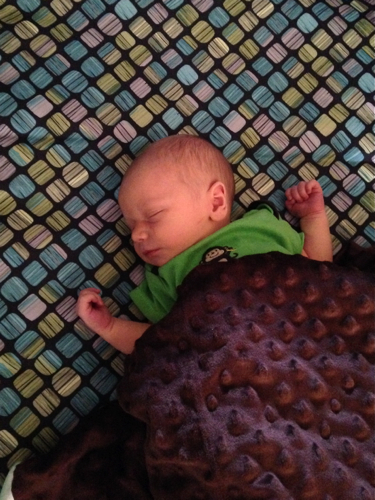 I think he’s a lucky little guy because he has so many grandparents who love him.